Your Get Found Profile ensures that your business information appears on all the major search engines, social media and top local sites. 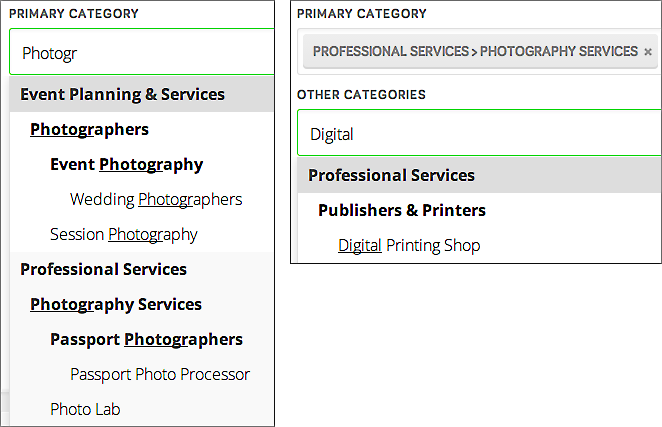 The Primary Category and Other Categories fields help Get Found identify the most appropriate ways to list your information. If you prefer a more hands-on method, you can open this plain text file, which will appear in a new window in your web browser. You will find it easiest to use your browsers's Find feature to search the file's 2,600-plus entries since the list is not alphabetical. 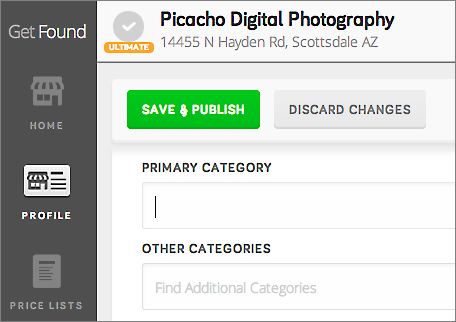 Note: Whether Menu Lists or Price Lists displays in the left-hand toolbar depends on the category you choose when creating your Profile. If you choose Restaurants as your Primary Category, the toolbar displays Menu Lists. If you choose a service-oriented business, Price Lists displays.